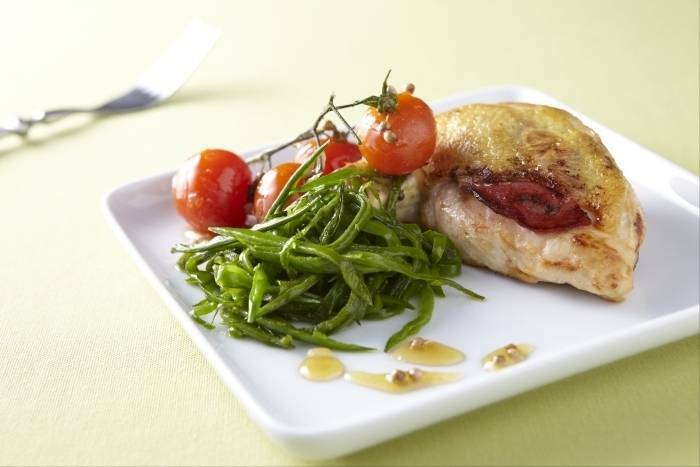 Chicken breast stuffed with chorizo and served with cherry tomatoes cooked in a coriander syrup and crunchy mange tout. Gently lift the skin away from the meat on each chicken breast to create a pocket. Add slice of chorizo to each pocket and then press the skin back down. Season the chicken with salt. Heat a frying pan to hot and add a drizzle of olive oil. Add the chicken to the pan skin side down and cook until golden brown. Turn each chicken breast over and then add half a glass of water to the pan. Cover with a sheet of foil and then leave to cook for 8 to 10 minutes over a low heat. Add the sugar and water to a frying pan and bring to the boil. Reduce to a syrup and then add the coriander seeds. Add the tomatoes to the pan and cook until the skins split. Remove from the heat and set aside. Cut the mange tout into fine julienne slices. Heat a frying pan and add a splash of olive oil. Add the mange tout to the pan and cook over a high heat for 3-4 minutes. Season with salt. Serve the chicken alongside the tomatoes and the mange tout. Finish with a pinch of fleur de sel and piment d'Espelette to serve.